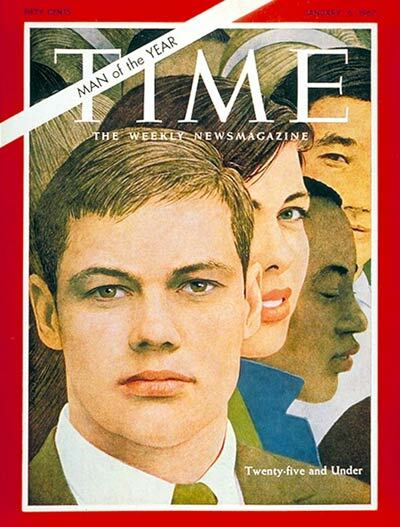 In 1966, Time chose “The Generation Twenty-Five and Under” for its Man of the Year issue. This group went on to become the 76.4 million people known as Baby Boomers. As a group, would-be Boomers were the wealthiest, most active and most physically fit generation up to that time. Many of them grew up genuinely expecting the world to improve with time. They liked Ike and loved Lucy. They watched in awe as Elvis Presley twisted his hips and squealed as the Beatles invaded the US. They were the first generation to attend integrated schools. They were encouraged to turn on, tune in and drop out. They sat in the rain for “3 Days of Peace & Music” at the Woodstock Festival. They learned to duck and cover and got their news once a day from a Newspaper. They were told the medium is the message so they attached tin foil to their rabbit ears to watch 3 television stations… in black and white. They bought chewing gum, cigarettes, even cars because they liked the advertising jingles. So what are these Boomers up to today? Catch up with these 10 mind-blowing Baby Boomer facts.